For decades, the University of Wisconsin-Extension has had a presence in all 72 Wisconsin counties, teaching, learning, leading and serving. Since it was founded in 1906, UW-Extension has connected thousands of people with the University of Wisconsin, engaging with them in transforming lives and communities. As the Latino population grows, UW-Extension is acting on its commitment to serve this community by further understanding it and assessing its needs. 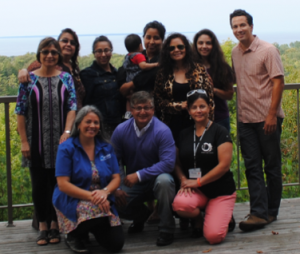 From 2015 to 2016, the University of Wisconsin-Extension, Cooperative Extension, with the assistance of members from its Latino Employee Resource Group, conducted a study on Wisconsin Latino Families in the counties of Milwaukee, Dane, Racine, Kenosha, Fond du Lac and Door. The purpose of this study was to better understand how Latino Families are integrating into local communities and to assess their educational needs. The findings and recommendations are a result of analysis on data collected from surveys, focus-groups, and one-on-one interviews with Latino parents and key community stakeholders. This study serves as the primary source of information for this website.